Mickey Harte heads to Croke Park to face Dublin on Saturday week with his team's form on an upward trajectory. 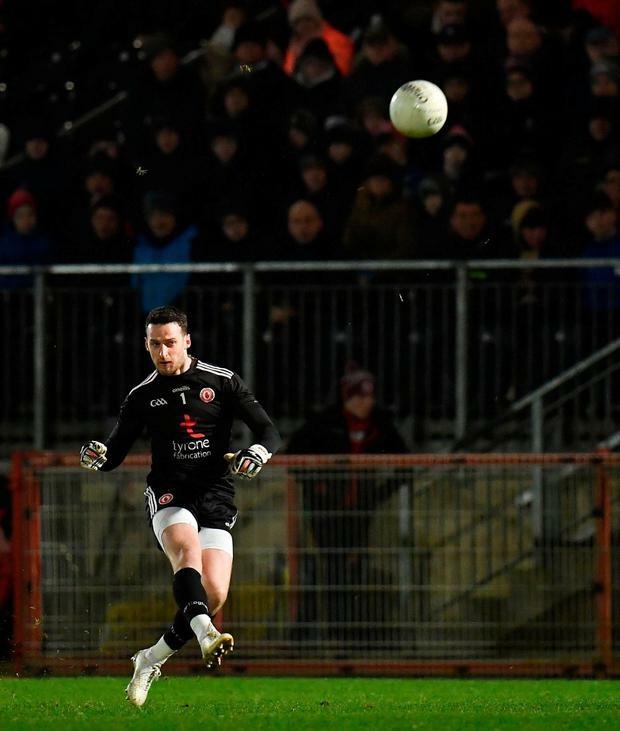 At a windswept Omagh on Saturday night he oversaw a second league win to bolster their position in Division 1 and last year's All-Ireland finalists appear to have shaken off their early poor form. Harte, for whom the next round will be a landmark 300th competitive tie in charge, spoke afterwards of that slow start and singled out the Mayo defeat as the most troubling. "We just didn't seem to be at the pace of the game after the first 25 minutes when there wasn't much in it, and then fell apart just before half-time and never really put up a fight in the second half. And that was so un-Tyrone-like." 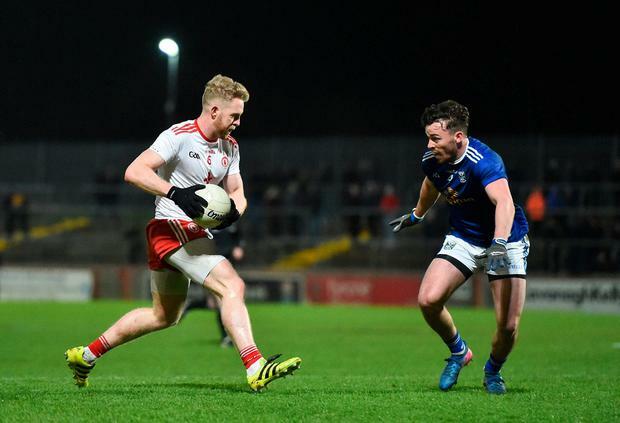 On Saturday, in a game that fell on the 15th anniversary of the death of former captain and All-Ireland winner Cormac McAnallen, Tyrone were more like themselves and won comfortably when taking control of the match after half time. Cavan, just four points down (0-8 to 0-4) at the interval after playing into the strong wind, were part authors of their own downfall. Three minutes into the second-half they lost Killian Clarke, who received a second yellow card having caught the referee's notice with a number of earlier fouls. 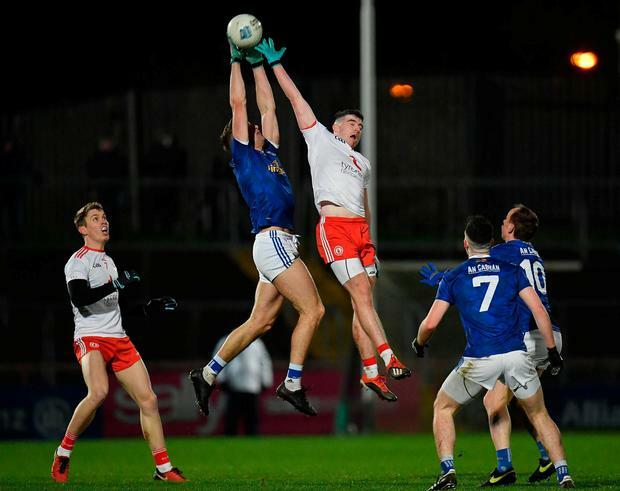 Tyrone quickly pegged on two points and in the 51st minute a well-finished goal by the outstanding Peter Harte, after excellent build-up play by sub Darren McCurry, left Cavan with little prospect of rescuing the situation. Kyle Coney and Hugh Pat McGeary added points to open a 10-point advantage. Harte acknowledged the loss was calamitous for Cavan. "It wasn't just any player, it was Killian Clarke, one of their main players, so he was a huge loss. I wouldn't like to lose one of my key players in a game as vital as that and they were unfortunate." Peter Harte gave another show of exemplary leadership and in a two-man attack with Cathal McShane, Mattie Donnelly also caused Cavan numerous problems. The visitors were also undone by poor shooting, notably from placed balls. 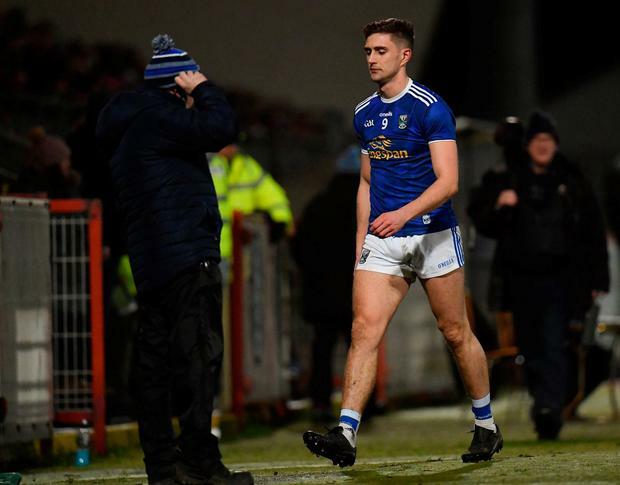 Cian Mackey came on in the second-half and was instrumental in a run of three Cavan points without reply, but they never threatened to score a goal. The defeat returned them to the foot of the table and needing a small miracle to survive, with Dublin one of their remaining opponents. 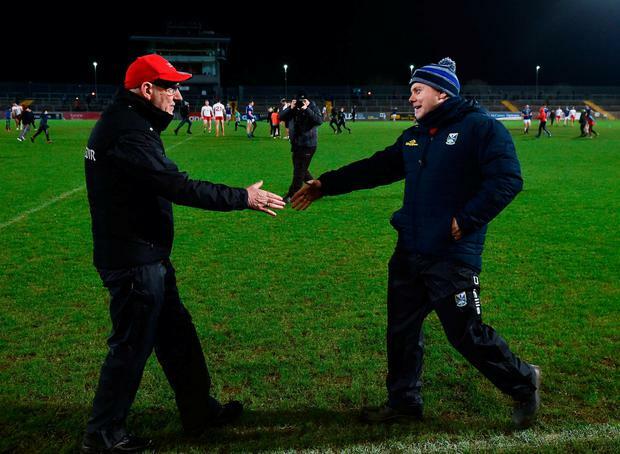 "We wouldn't be happy with the performance at all," said Cavan manager Mickey Graham. "The game was riddled with errors. We coughed up possession very easily at times and took wrong options." Cavan's best football came in the first-half into the wind, with Tyrone lying deep and inviting them on. Jack Brady kicked them in front with a sixth-minute free and while Tyrone scored the next five points, a free by Martin Reilly had Cavan just a goal behind 10 minutes from the break. From there to the interval Harte's influence grew and Niall Sludden kicked two stand-out scores from play. Dara McVeety and Conor Moynagh, two of Cavan's best players on the night, combined in injury-time for McVeety to score and leave them well within reach with the wind on the restart. Clarke's red card, though, changed everything. "I thought it was harsh at the time," Graham said of the tackle on Kieran McGeary which led to Clarke's dismissal. "I thought your man (McGeary) was falling into him. It was a big blow to us and we had to rejig the thing around a bit because Killian has been a key player for us." Scorers - Tyrone: P Harte 1-3 (3f), C McAliskey 0-3 (3f), N Sludden, HP McGeary 0-2 each, C McShane, F Burns, K McGeary, K Coney, M Donnelly (f) 0-1 each. Cavan: C Mackey 0-3 (2f), J Brady 0-2 (2f), M Reilly (f), D McVeety, R Galligan (f), N McKiernan (f) 0-1 each. Tyrone - N Morgan 7; P Hampsey 7, R McNamee 6, HP McGeary 8; T McCann 7, F Burns 7, C Meyler 7; B McDonnell 7, R Donnelly 7; K McGeary 7, N Sludden 7, P Harte 9; C McAliskey 6, C McShane 7, M Donnelly 8. Subs: D McCurry 7 for McAliskey (45 mins); K Coney 7 for McShane (46); H Loughran 6 for K McGeary (54); L Brennan for 6 McNamee (inj 58); R Brennan for 6 Hampsey (61). Cavan - R Galligan 7; J McLoughlin 7, P Faulkner 7, C Moynagh 8; C Brady 7, D McVeety 8, C Rehill 7; P Graham 6, K Clarke 6; M Reilly 7, C Conroy 6, N Murray 7; N Clerkin 6, J Brady 6, C Madden 7 Subs: T Galligan 7 and G Smith 6 for Graham and Clerkin (half time); N McKieran 7 for Brady (49); C Mackey 7 for Conroy (52); S Murray 6 for N Murray (66). Ref - P Hughes (Armagh).